Much to Sam’s relief this is the last Tuesday night Skegness this summer. With us not getting back from Holland until 10.30 last night and it taking us 15 hours, we are all pretty knackered and could have done without it if I’m honest. Anyway Phoebe’s allowed to race again tonight and she’s looking forward to it. I have some work to get on with so I leave Frankie JJ and Sam to take out the engine in his mini. The damage that occurred last week turned out to be a snapped crank shaft. We replace it with Phoebe’s shale engine so he can race at Skeg tonight. Heat 1 and all 18 cars are in. Frankie looks to be really quick and he manages to get a credible 4th. Phoebe struggles a bit and finishes 8th. She’s really disappointed with this. We thought we could hear Frankie’s car missing into the corners so had a look when he got back in, but wasn’t sure what it was. Phoebe had damage from being ‘t boned’ the last time she raced and on further investigation we discovered she had a broken back shocker which was fixable. 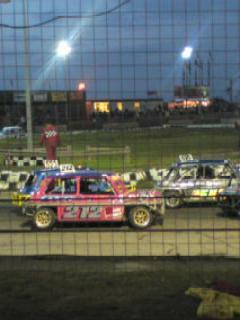 Out they go for the second heat, and once again Frankie is fast and going well until 5 laps to go and Bang! Followed by smoke! It could only mean one thing – another blooming engine and more expense. So with only one engine between 3 minis and a shale/tarmac meeting fast approaching I’m not quite sure what’s happening this weekend yet. Sam’s doing her best to win the lotto but not even a tenner so far!